The utility copies trades from the signal provider accounts (master accounts, one or multiple providers) to unlimited number of receiver accounts (slave accounts). The provider is defined by the 'provider' parameter (any combination of numbers and letters). For example, there are two providers. Run the utility in master mode on them, and set different values to the provider parameter. On the account designated for copying these signals, run two utilities in slave mode in different windows, setting the 'provider' of the first provider to one of them, and 'provider' of the second provider to the other one. The copying can be set in the opposite direction (reversed), and also with a size (greater or less) changed by the multiplier. 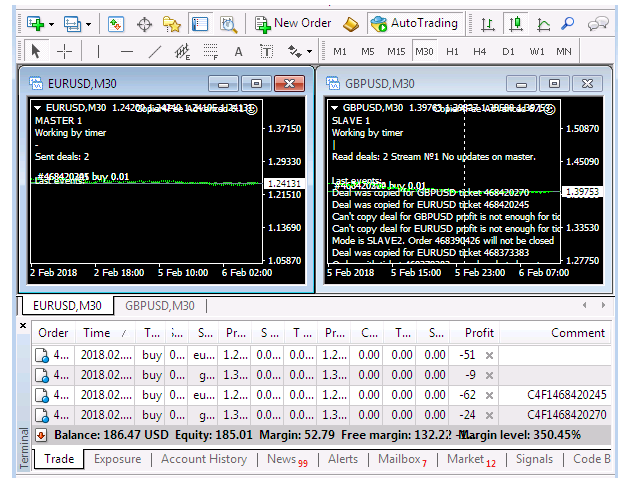 The utility monitors the changes in the stop loss and take profit orders of the positions copied from a master account. The comments with all the recently performed actions are displayed on the screen to monitor the utility actions in slave mode. The utility does not interfere with the positions on the slave accounts opened manually or automatically by other experts/utilities. To avoid premature closure of positions of a slave account due to the spread difference with the master account, it is possible to disable copying the stop loss and take profit orders by setting the corresponding parameters to 'off'. The utility is able to copy the trades on instruments that have prefixes/suffixes. To do that, specify them in the 'prefix' and 'suffix' parameters. In case the master and slave accounts have the same prefixes and suffixes, these parameters can be left blank. The utility does not copy the instrument listed in the 'No trade list' (space seaprated) parameter. The instruments should be specified in this list together with the prefixes/suffixes and separated with spaces. The product features the replacement list used in case symbol names do not match at all. The utility copies open profitable orders or unprofitable trades. The size of the profit/loss of the copied position is set by the 'Copy loss trades (-pips) or profit trades (+pips)' parameter in points. If the parameter is set to zero, the trades are copied within the price range of ±Slippage & Price difference (in pips). This feature is not available in the free version. During the reverse copying of trades the utility starts trailing the stop loss order on the slave account if the trade is closed with a loss on the master account. Trailing is enabled by setting the 'Trail stop loss (in pips)' parameter. This feature is not available in the free version. The free but limited version is available in the Market under the name Copier4Free. Attention! In the slave mode, the Copier uses the comment field to identify the copied trades. Therefore, this field must not be modified by the trading server when opening trades. The utility follows the timer with a second delay. If failed to install the timer, for example, due to the server overload, the utility switches to the tick mode informing of this in the symbol chart comment. Copier mode - copier operation mode, master (signal provider) or slave (signal copier), slave2 mode - copying signal with closure only by tp/sl or manually. Provider number - account number of the signals provider. Prefix - prefix of the copied pair. Suffix - suffix of the copied pair. Slave number - number of copier of trades from one provider. Copy with reversal - copy trades in the opposite direction (reverse). Recopy closed deals - in case a trade closes on the slave account and the price returns to the trade opening price, and also if the trade is present on the master account, the copier copies it again. How many times to recopy it - how many times to recopy closed deal again. Copy stop loss - copy the stop loss. Copy take profit - copy the take profit. No-trade list (space separated) - list of pair not to copy, separated by commas, with prefixes and suffixes specified, if any. Trail stop loss (in pips) - trail the stop loss order. Enabled in case a trade is closed on the master account. Copy loss trades (-pips) or profit trades (+pips) - copy profitable or unprofitable trades. Slippage & Price difference (in pips) - the maximum allowed value of the difference in price on the master and slave accounts, at which copying is performed. Do not copy if spread > - disable copy trading if the spread exceeds the specified value. Multiply lot of copied deals by - copy trades with the lot size increased by the specified multiplier. Fixed lot size - copy the trade but open it with the specified lot size. Maximum lot size - limit of the maximum volume of the order opened by the copier on a slave account. Lot size as a rate of Free Margin (%) - set lot size as % of Free Margin, all other parameters for sizes should be 0. Play this file if amount of deals changed - play a specified sound file in case of any changes with trades. Show last events - inform of the last utility actions. Replace list in brakets, space separated - symbol names replacement list. For example, S&P(SP500) PNS(PANASONIC) APP(APPLE). Send Pending Order - copy pending orders. Do not copy deals with magic (space separated) - do not copy trades with the specified magic number. The numbers must be separated by periods. Copy only deals which have this string in comment - copy only trades that have this string in the comment. Play this file if amount of deals changed - play the specified audio file in case of any changes to trades. I have bought Copier4Free advanced. Отличный продукт и отличная поддержка автора!! Very good product and support! Отлично работает. Сразу купил, так как валюта для триала не пододит. Настроек требуется минимум. Удобно, практично и цена демократична. Rented for a year and will definitely buy once this year is up. Great utility that does exactly what it's supposed to do. Two thumbs up. Good product with fast response creator! So far so good use this tools, but I have a little problem. The order on master account becomes double although the master only entry one position. I will check it later about this. Exceptional support! My broker was changing comments of trades from server side which is breaking EA's functionality and the author provided great support to solve my problem. He spent time and money to solve it. I have never experienced such kind of customer support from anyone or any company in my whole life. You can %100 trust him. Автор помог настроить под свои нужны за пару минут! за полчаса модифицировали копир , так как мне надо , огромное спасибо, за скорость реакции на запросы и качество продукта. Feature fixed wich sets take profit and stop loss while deal is being copied in reverse. 1. Added parameter "Copy-only list". Currencies not listed in this list will not be copied. If the list is empty, all currencies will be copied. 2. The values ​​of Stop loss and take profit of copied deals can be set through the parameters "set my own stop loss" and "set my own take profit". "Copy deals if lot size is outside this range"
"... or inside this range or equal (space separated)"
with their help, allowable ranges of volumes of copied positions are set. The values ​​of volumes in the ranges are specified through the gap. For example. 1. Have been added parameter wich define times of copying closed deals. 2. Lot size of copied deals can be defined via Free Margin. 1. Added the replacement list used if copied symbol names are different. For example: If the symbol is called S&P on a master account and SP500 on a slave one, specify S&P(SP500) in the replacement list of the latter one. You can specify any amount of symbols separated by spaces. For example: S&P(SP500) PNS(PANASONIC) APP(APPLE) etc. 2. All data on the utility actions is displayed on the screen on a slave account for more control. 3. If it is impossible to launch the utility by timer, it switches to working by new ticks. 4. The utility uses the comment field of copied trades to identify them. Copying mode was interrupted if a broker added additional info to the comment. This has been fixed. Plays the specified sound file if the number of trades on the accounts has changed (trade copying or deletion occurred). 1. Added the possibility to limit the maximum size of the order opened on a slave account. 2. The magic numbers of trades not to copy can be set as a list. Numbers should be separated by commas. For example .3445.6789.78.5.4. - trades with such magic numbers will not be copied to a slave account. 1. Added the 'Timer (in seconds)' parameter, which sets the order scanning interval. It can be used to reduce the load on the terminal. The greater the interval, the less the load. 2. Added the 'Slave number' parameter. It can be used to set the number of the copier, which works in the Slave mode from one Master provider. 1. Added the 'Fixed lot size' parameter. If specified, the copier opens a deal using a specified size in slave and slave2 modes. 2. Added the 'Copy deals which have this string in comment'. If specified, ony the deals having a specified set of symbols in the comment are copied. 1. Bug is fixed, which prevented from opening numerous orders opened at the same time on master account. 2. Lag between copying deals is added - lag_in_sec. 3. Slave2 regime was added. In this mode deals which were closed on master-account manually will not be closed on slave-account. 4. If re_copy parameter is set to "off" the deals which were closed at slave-account, but still opened at master-account, will not be reopened again.